Custom Promotional Products and Materials | Copy This, Ship That! Promotional Products are a great way to get your message in front of your clients and if done correctly, can keep it there for a long time. How do you make sure that your message stays in front of your clients and isn’t thrown out? We can help you find the right item at the right price to achieve your marketing goals. Branded apparel is a great way to advertise your business, make your employees feel part of the team and portray a consistent image for your business in the marketplace. With more than 500,000 items available, it can be very overwhelming even trying to decide where to start. 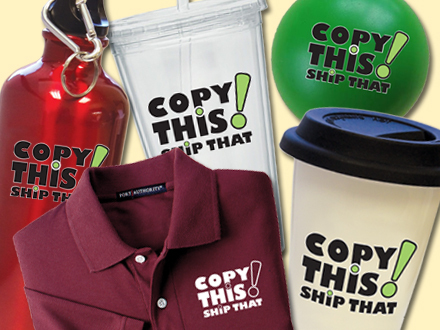 Copy This, Ship That works with the best suppliers in the industry and our highly trained passionate promotional products team can search for unique ideas to help you stand out at your next training session, trade show, corporate event or even your kids soccer game! Our corporate apparel options include Nike, Ogio, Adidas, Puma, Calloway, Travis Matthew, Brooks Brothers and more. We carry a full line of apparel from house brands to designer apparel, sure to fit your budget!